An unusually cold Friday May evening in May found me dashing to the welcoming Queen Street home of the Scottish Malt Whisky Society and, for one night only, home to Pacari Chocolate for a pairing tasting evening. We were introduced to 5 glorious dark chocolate with enthusiasm and special tips on how to enjoy dark chocolate (let it sit on the tongue, don’t munch it!). Our whisky society guide also took us on a tasting tour of 5 glorious whiskies ranging from soft Speyside to peaty Islay malts. With large tables set in the classic high ceiling rooms of an Edinburgh town house and PHD levels of information about the subjects, it was easy to lose oneself in the pure pleasure of exploring the flavours. 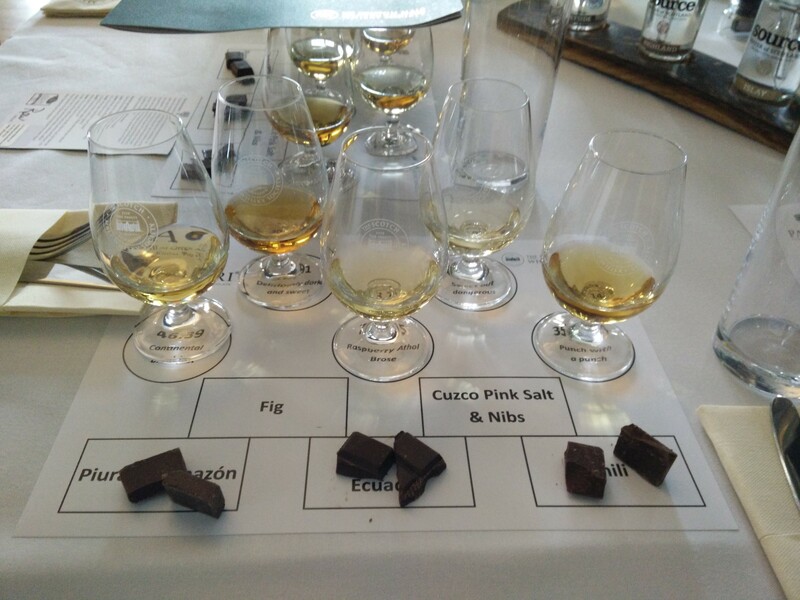 At cask strength, these whiskies pack a punch and were paired beautifully with the chocolate. My favourite was a whisky aptly name Raspberry Atholl Brose which worked perfectly with the naturally fruity flavours of Pacari’s Ecaudorian Los Rios. Half way through we were treated to a delicious chicken pie to help with the next round! Finishing on a high note we enjoyed a smoky peaty Islay malt with Cuzco Pink Salt & Nibs. I adore salt with chocolate, the savoury note seems to lift the chocolate to a new level and the nibs gave it an added textural hit. Leaving the whisky society to a pink sunset I had time to reflect on what had been a glorious evening of flavour discovery and I for one can’t wait until the next one!